Dr. Sharaiha performs the endoscopic sleeve (accordion procedure) in New York. The “endoscopic sleeve” procedure is similar to the gastric sleeve surgery, but is a non-surgical option. The entire procedure is done through the mouth so there are no incisions necessary. The endoscopic sleeve procedure restricts the size of the stomach to much less than its original capacity. 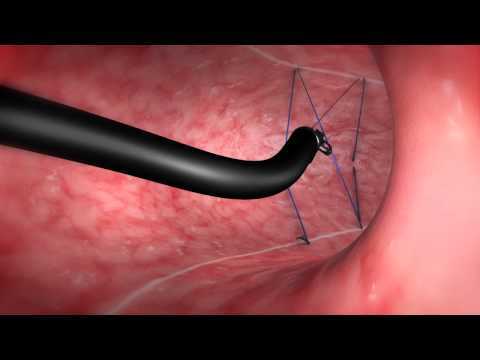 A benefit of the endoscopic sleeve, as compared to surgery, is this a reversible procedure. In addition to being reversible, the endoscopic sleeve can be redone if the patient needs their stomach to be resized again. It is preferred by some patients who are unable to have a surgical procedure, or would prefer not to. Patients generally spend about 2 – 3 hours in the recovery room before going home the same day. What is Endoscopic Sleeve Gastroplasty or accordion procedure? An endoscopic sleeve gastroplasty – also known as the accordion procedure – is a minimally invasive procedure. It is a weight loss procedure offered to patients who are not candidates for bariatric surgery. Using an endoscopic suturing device, the endoscopist constricts the stomach, resulting in a “sleeve”. The patient is placed under general anesthesia, and the doctor places a scope down the patient’s throat sutures are inserted in a specific pattern from the bottom of the stomach (antrum) to the top (fundus). The series of sutures is then tightened in a fashion that resembles an accordion, constricting the overall usable volume of the stomach. Patients generally follow a liquid diet for a brief amount of time after the procedure, and often can go home that same day. After the procedure, the patients can only consume a small amount of food. This procedure is performed in conjunction with diet and exercise to achieve weight loss. Both our bariatric surgery program and our gastroenterologists who perform the ESG work closely with a team of doctors including an endocrinologist and nutritionist to monitor one’s food intake and metabolic health before and after the procedure. Diet and exercise remain an integral part of a patient’s health regimen before and after the procedure, but constricting the stomach to reduce the amount of food one can eat helps turn the corner toward weight loss. Who May Qualify for an Endoscopic Sleeve Gastroplasty (Accordion )? If any of these apply to you, contact Dr. Sharaiha about the endosopic sleeve. What are the Endoscopic Sleeve Gastroplasty (Accordion) Outcomes? The Center for Advanced Digestive Care at NewYork-Presbyterian/Weill Cornell Medical Center was one of the first centers in the country to perform the endoscopic sleeve gastroplasty, and published some of the earliest effectiveness research. Findings demonstrate that patients may lose 30% to 60% of their excess body weight within six months of their procedure. Not only does a patient see a decrease in body weight, but often related comorbidities such as high blood pressure, diabetes and sleep apnea can improve after having this procedure. For those interested in viewing a more technical presentation of data from a study Dr. Sharaiha conducted, please click here. Have a question? Send Dr. Sharaiha a note here.